Today’s topic is Fastpass Plus. It’s a new feature that Disney has rolled out in the past year. I’m going to give an overview of what Fastpass Plus is for our newer readers and then go into a debate of whether Fastpass Plus is great idea or has caused guests to “overplan” their vacation. A little history on the Fastpass system at Walt Disney World. 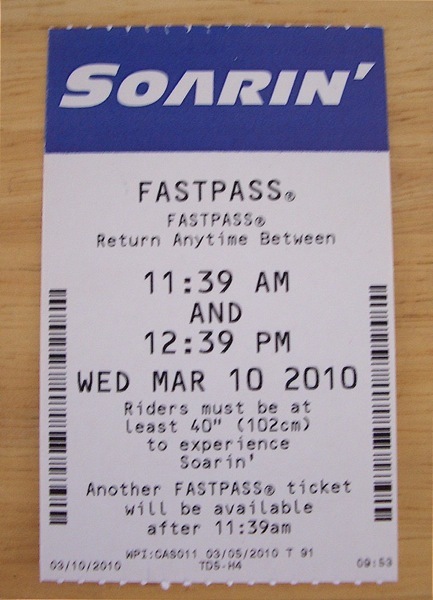 Fastpass came to Walt Disney World in 1999 as a concept for guests to create a “ride reservation.” Guests would slide their Key to World Card into a Fastpass machine which would then print out a ticket with an hour time window for guests to return to go on the ride. When guests returned for their “ride reservation,” they went into a special Fastpass queue and bypassed the standby queue. Fastpasses were limited and once the daily allotment of Fastpasses were gone, guests could only go on the ride via the standby queue. 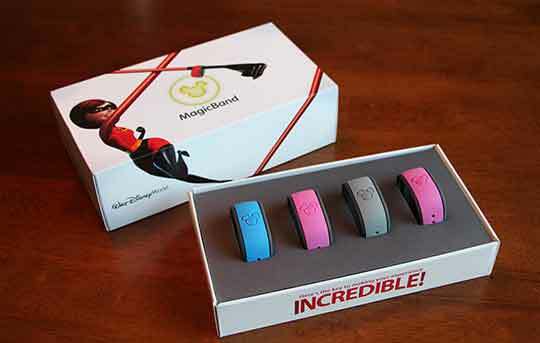 Starting in 2013, Disney moved fully implementing the My Disney Experience and the MagicBand. The MagicBand replaces the Key to the World card. These MagicBands are now a guests all-in-one ticket to all things Disney. It is a guest’s room key, park tickets, Memorymaker ID, food payment (linked via credit card or Disney Dining Plan), and Fastpass Plus distribution. Guests can now stay making their Fastpass Plus reservations starting 60 days from the start of their vacation. 60 days is now a “magical milestone”, like 180 days for Disney dining, for a Disney vacations. At 60 days, guests can now check-in into the hotel room on-line and their Fastpass Plus window opens for their vacation. Guests can make three reservations per day, however, those three reservations must be in the same park. Maelstrom is now a Tier 2 attraction while Living with the Land has taken it’s place in Tier 1. The Character Spot also moves down to Tier 2. The Great Movie Ride is now a Tier 1 attraction. 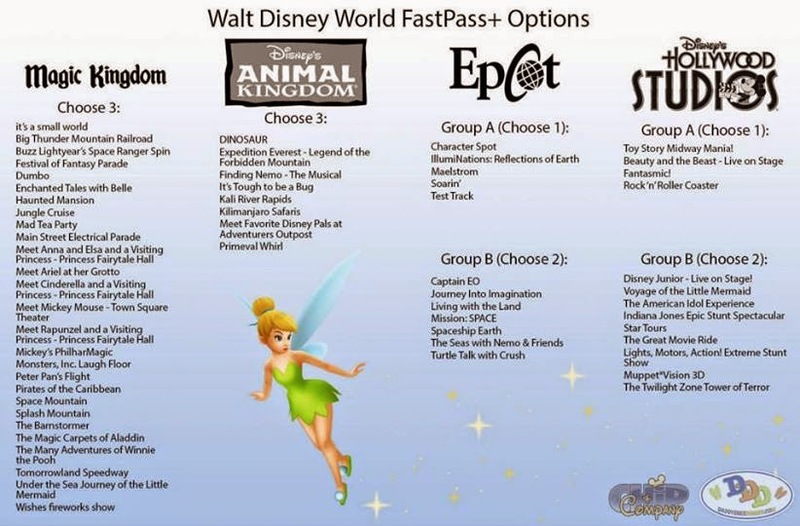 There have been no changes to the Fastpass Plus attractions at Animal Kingdom or Magic Kingdom. Please refer to the above picture for Fastpass Plus attractions at those parks. 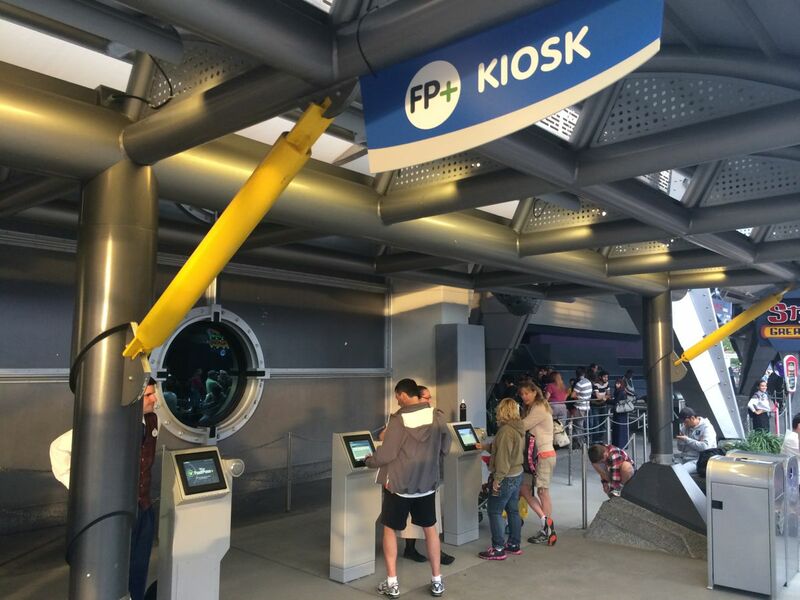 After a guest uses all three Fastpasses or their time window has expired, a guest can go to a Fastpass Plus kiosk or log into their My Disney Experience app on their phone, tablet, or laptop and sign up for a fourth Fastpass. This fourth Fastpass does not need to be at the same park as the previous three Fastpasses. The same process hold true for any subsequent Fastpasses in the same day. Fastpass Plus reservations can be used on select rides and character meet and greets as well as viewing locations for select Disney parades. Viewing locations were not available under the old ticketed Fastpass system. Now onto the debate portion of our show. There are some people who think that Fastpass Plus is a great idea. On the flip side, there are others who think that Fastpass Plus results in overplanning and adds to the stress of the vacation. Looking at the big picture, I can see both sides of the debate. 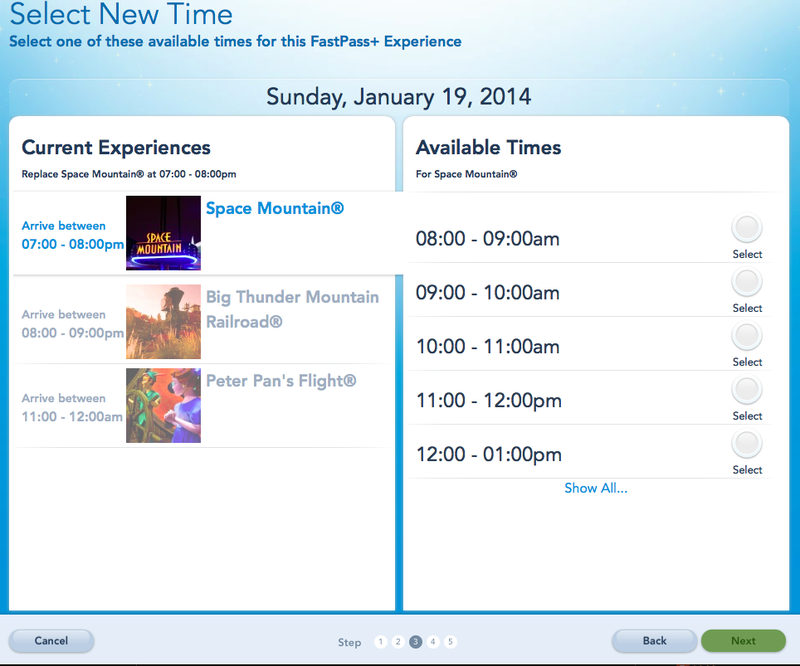 Fastpass Plus is a new technology but it is old at the same time. Because guests are able to make your Fastpass Plus reservations 60 days ahead of your vacation, guests no longer have to arrive at the parks right at park open and then sprint back to their favorite attraction in order to snag a Fastpass ticket. This was last seen at Toy Story Midway Mania where guests, at first, had to be ushered back to the attraction via a roped-off track and into the Fastpass queue. Then the roped-off track was taken down and it became a full on sprint back to Toy Story Midway Mania. I remember being in this sprint a couple of times. The first time I made a wrong turn and turned away from the attraction. The result of that wrong turn was a Fastpass time that was 60-90 minutes later than if I had made the correct turn. So, from this aspect, I can see how Fastpass Plus and its advanced reservation process is a good thing. Another benefit of Fastpass Plus is the addition of viewing locations along parade routes and fireworks shows. Previously, the only way to get a “prime” viewing location for a parade was to grab a spot along the parade route sometimes two hours ahead of the parade. The same holds true for fireworks. In addition, fireworks have a hard-ticketed dessert party or something similar but this comes at an additional cost to the guest. Using a Fastpass Plus does not have this additional hard ticket cost. Now we come to the other side of the debate. Is all of this overplanning? To some people, Fastpass Plus has created another tier of advanced planning which they deem unnecessary and only adds to the stress of planning their vacation. I’m friends with one family who is going to August and is rapidly approaching their Fastpass Plus reservation date. The approaching date is only creating more and more stress in planning their vacation. They have to figure out what park they want to be in each day, when do they want to get there, how long do we want to stay, does it conflict with our dining reservation, what happens if we have a toddler meltdown and have to quickly leave the park. They wouldn’t have to deal with ANY of these issues if Fastpass Plus and the 60 day advanced reservation window didn’t exist. They were happy with the old Fastpass ticket system. 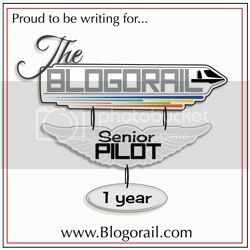 Advanced planners could argue “well then, don’t participate in the Fastpass Plus reservation system.” My response to that is, why should they be punished and be stuck waiting in longer standby queue solely because the new technology doesn’t fit their travelling and park going style. Not everybody plans their Disney vacation in the same manner. 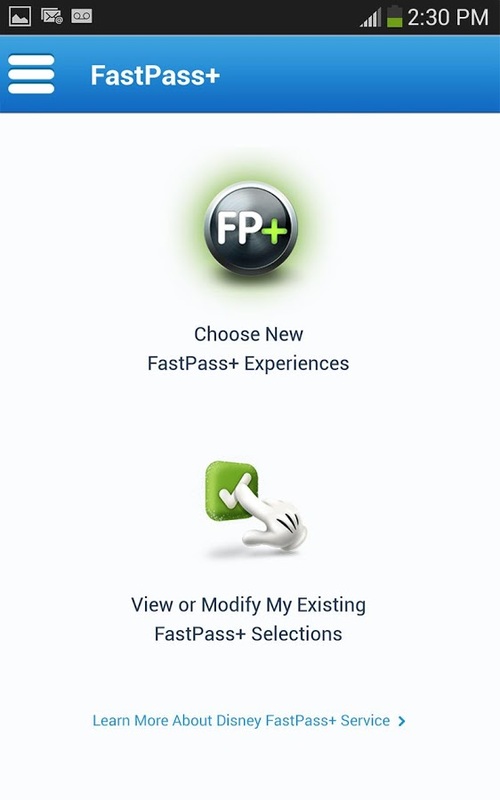 Now with Fastpass Plus, everybody needs to have a similar philosophy in order to get full use of the new system. To me, Fastpass Plus has taken away some of the spontaneity of going to the parks. My family usually plans our days around our ADRs and going to park accordingly. If we have a lunch, for example, at EPCOT. We would go to EPCOT in the morning, have lunch, return to the room for a swim, and then go to another park in the evening. Under my family current park planning philosophy, we have to choose whether we want to use our Fastpasses at the morning park or the evening park. The other thing we could do is change our park planning philosophy to fit the new system. The other thing the new Fastpass Plus system does is take away the ability to spread “Pixie Dust” to other families. Under the old system, the person who held the ticket was not the person who had to use the ticket. This ticket could be transferred to another person. On numerous occasions, I would be holding a Fastpass for an attraction which I couldn’t use because my plans had changed. I would give my Fastpass to another person or family if I had multiple Fastpasses. Now with Fastpass Plus, I can’t do this because it is linked to my MagicBand. I have to “eat” this Fastpass instead of giving it away to another person or family who could benefit from the Fastpass. As I stated, in the beginning, I can see both sides of the argument about Fastpass Plus. Those who love to advance plan can now have their entire vacation planned out 60 days in advance and it makes crowd management easier for the parks to handle. On the other side, not everyone likes to advance plan but now forced to advance plan to some extent if they want to be sure that they can go certain attractions which have a long wait or get their coveted Anna & Elsa autograph. Thankfully, Disney has accommodated some of the demand by extending the Anna & Elsa hours from park open to 5 pm to park open to 30 minutes before park close. This has reduced the wait time to an extent but not completely eliminated them. Where do you fall on the great Fastpass Plus debate? I’m sort of on the fence still. I like the idea of being able to lock in our favorite rides. But we’re not used to deciding that far out which park we’re going to go to on which day. Often, we would wait to see what the weather was going to be like, since we usually try to hit one of the water parks during our visits. We would pick the best weather day for the water park, then fill in with the other parks. Can’t really do that with the 60-day out planning needed to make best use of FP+. That being said, the need to pre-plan for ADRs has a similar effect. The reality of a Disney vacation is that it requires some advance planning if you’re not planning to just sit by the pool the whole time. Sounds like your family is in the camp as mine. Fastpass+ is a good idea but people need to have some flexibility in their vacation planning because of unforeseen events like weather once you are there. Not everything is set in stone 60 days ahead of time. Plans change. We are long time WDW fans, visiting at least once a year since 1989. This new change has been the hardest one to find positive. We went with a large group in October and were very patient with the difficulties that were part of the FP+, spending more than 4 hours on lines at Guest Relations to make our bands work and link our passes to each other. Now, in preparing for our trip in June, the time on the phone with Disney has exceeded 7 hours. Linking is still a problem. The system is not equipped well for large groups and present limits in the choices. When I traveled with my young children and had complete control of the day, I think I would have loved this. Now that my kids are in their teens and 20s, the limited flexibility is not good. And the linking with another party…. took so much time ! We could have waited on line easier. So far, the best part is that we do not have to run for that early morning FP, but the limited flexibility is not worth that plus. Thanks for the insight regarding large groups. I’ll be going down with a large group in November. Hopefully, there won’t be any hiccups. We are long time Disney fans, visiting at least once a year since 1989. I find the new FP+ the most difficult to handle of all the changes I have seen transpire. We visited in October and spent more than 4 hours at Guess relations trying to get the bands to work and link FP on them. For this trip in June, we have spent more than 7 hours collectively to get the FP+ system to work for our group. ( Well I hope it works, we shall see). It is not a system designed for flexibility and for our group, families with older children, we are ready to be flexible and spontaneous. Where was this when I had young children and we went with a multi-page itinerary from which there was no deviation? Now, I have to book 3 FP+ when I only want one, then I cannot get a new on in another park until those are gone. I also cannot get them for my entire group because some of the 20 somethings have park passes that they need to add more days to when we arrive. It has not been a happy planning experience for me and I LOVE the planning !! Keeping my fingers crossed, but it does not look like the best idea….